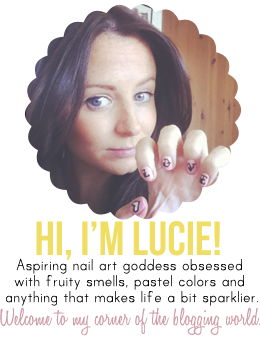 This lady is the Queen of Nail Art and I am sure no other nail polish lover will disagree here! She is amazing. I've been following here blog on tumblr for ages and I am never bored with the funky and sometimes outrageous designs she comes up with! I received an amazinggg Christmas present from my bf.. I was treated to my own manicure and nail art design by one of Sophy's fantastic team members (who also has a blog you can find here) I chose to have a V Gap design done which to some may seem a little boring but I really used to struggle with doing them myself and wanted some tips and tricks from the proffessionals! Its a shame my nails were so short when I had these done.. they were battered from the festivee period! I'm not sure which black she used here but the gold was a Topshop varnish which i whipped up as soon as I could after I had my nail art done as its soooo sparkly and lush! If any of you get a chance to get some nail art done by someone else or you want to treat a friend I highly recommend Sophy Robsons nail bar located on Kings Road, Chelsea! Does anyone else follow and love Sophy's work?